Wine barrels are used to store not only wine, but also spirits like brandy and whiskey. When cut in two, the "half-barrels" are popular planters in gardens. Whether standing up with flowers flowing from the top down or tilted on its side for the appearance of flowers spilling out of the barrel, making such a yard-beautifying planter does not require any special expertise. 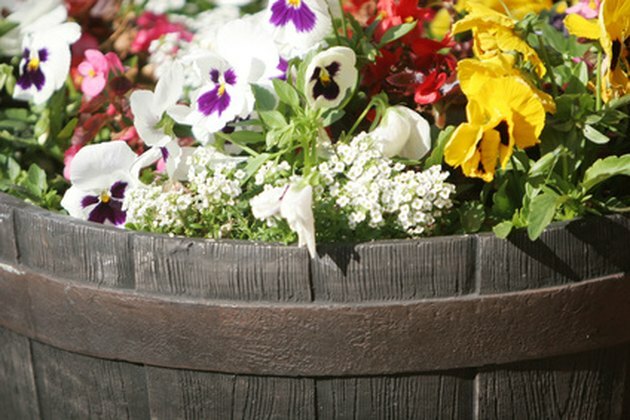 If you have planted flowers in a flower pot before, you can master arranging flowers in a wine barrel planter. Barrels make beautiful container gardens. Purchase a new or used wine half-barrel. These can be purchased at home and garden or home improvement stores during the growing season. They are also available from online sources. Determine if you want the planter upright or on its side and place it where it will be displayed. Adding dirt will make it too heavy to carry, although using a dolly will allow you to transport a finished one if need be. Drill seven or eight holes in the bottom of the planter for drainage, using a standard household drill. If you plan to lay the half-barrel on its side, drill the holes on the side that will be laying on the ground. Cover the interior bottom, or the drilled side, with the mesh or screening to keep dirt inside and insects out. Fill the upright half-barrel 2/3 full of high quality potting soil. Mix in 1 cup fertilizer and then fill with soil to the top rim. If creating a "spilling," on-its-side planter, fill it 1/3 to 1/2 full of soil and mix in the fertilizer by hand. Work a small amount of potting soil over the top of this mixture. Do not fill the half-barrel any further; the extra space allows for plant growth, light entry and air circulation. Plant flowers in the soil. 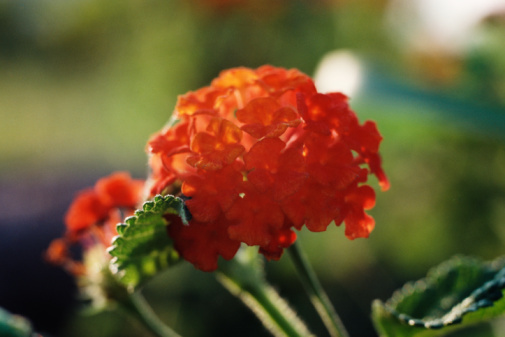 Tall annuals--such as the spike plant--are often used in the center of an upright planter, with a variety of colorful annuals, such as begonias or petunias, planted around it. Flowing plants such as morning glory or ivy can be planted to cascade down the sides. Water the container thoroughly until moisture is seeping out the bottom. This allows you to check the drainage, and will make sure the roots are saturated for optimum growth when first planted. How Does a Self-Watering Planter Work?